The Mendota Braided Snap Leash is your convenient classic dog leash. The solid brass swivel snap makes this leash ideal for everyday use and is non-corrosive. 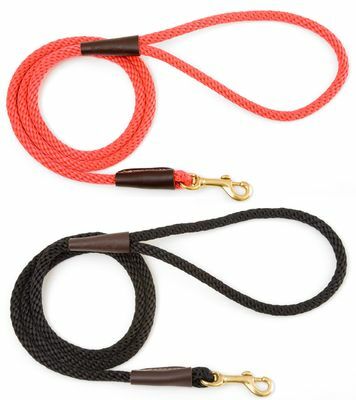 Made of out high quality braided polypropylene, this braided dog leash is durable, yet extra-soft to hold. Nice thick .5 inch rope with soft to the touch braid makes it very comfortable to grip. These braided leashes for dogs are the perfect solution for all-weather exercise and training whether walking in the park, street, or field. Solid brass, non-corrosive hardware, sturdy colorfast material, and genuine branded leather accents ensure a product that you and your dog can depend on.